I've watched the refurbishing or rebuilding of the Paramount Center as it happened over the years seeing as how I spent the last 3 years living in either chinatown or downtown crossing. And I hafta say, it looks pretty darn nice on the outside. Well, here's your chance to see it on the inside. 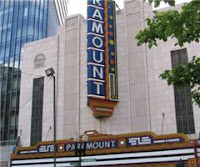 ArtsEmerson: The World On Stage announces free public tours of Emerson College’s Paramount Center, a cornerstone in the revitalization of downtown Boston. The facility includes the beautifully re-imagined 590-seat Paramount Theatre, the versatile, intimate Black Box Theatre, which can seat up to 150 people; the state-of the art 170-seat Bright Family Screening Room, as well as the scene shop rehearsal studios and soundstage, which allow for the development of new work. Tours will be given on Wednesdays through the summer at 11 a.m. and 4 p.m., production permitting. People wishing to tour the facility MUST make a reservation. Reservations can be made by EMAIL ONLY, and must be received by 5 p.m. on the Monday preceding the tour date. Reservation requests must be made to tours@artsemerson.org. Reservations will not be accepted by phone. Patrons will receive details about meeting place by return email. Ok so, the times make it a little tough to make for those of us with jobs. But perhaps I can send media rep DanDan to check it out. He's a grad student and as we all know, those guys don't do anything during the day anyway. 1 Response to "Free Tours of the Paramount Center"
Hahah, sad thing is, I could probably make it!